Applications are accepted between March 1 and April 30 every year. The goals of the Program are to broaden English immersion experiences for Taiwanese children and to establish inter-school relationships between Taiwan and the United States. Benefits for Program teachers include round-trip airfare, a housing stipend, overtime pay, health insurance, and a monthly salary based on educational background and teaching experience. The teaching duration is one academic year; contracts may be renewed subject to agreement between teachers and schools. 1. a native English speaker from U.S. states of Arkansas, Colorado, Kansas, Louisiana, Oklahoma, Missouri, Mississippi, and Texas. Applicants with ALL required documentation will be invited to take part in a Skype interview. A 5-minute video of applicant’s teaching demonstration (submitted via DVD, YouTube or Google Drive link) is required upon notification. Notification of acceptance will be sent to candidates by the end of June each year. 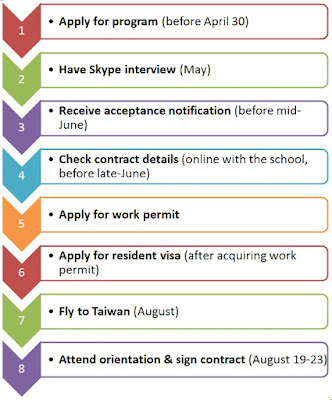 Accepted candidates are NOT automatically issued the work permit and/or the Resident Visa. 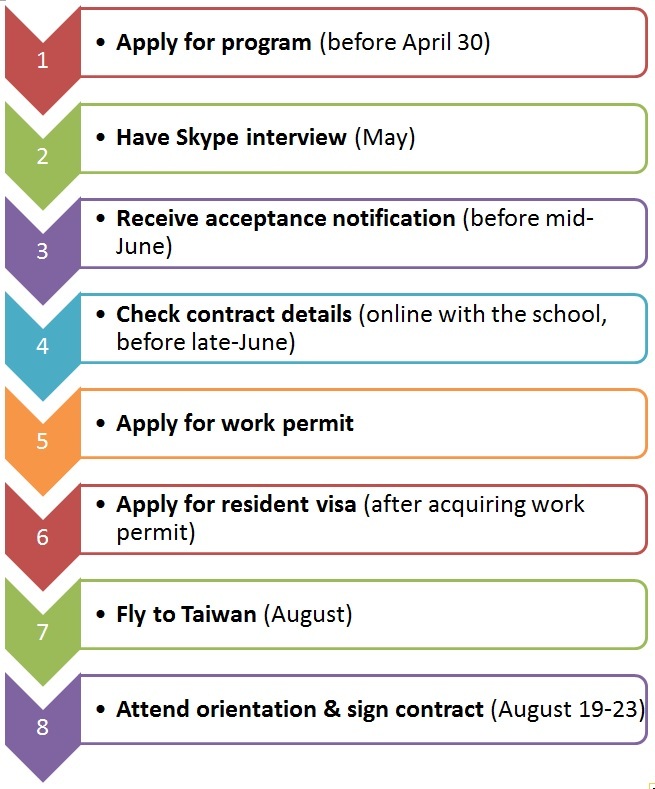 For the work permit application, please visit the Ministry of Education, R.O.C. (Taiwan). For the Resident Visa application, please visit the Bureau of Consular Affairs, Ministry of Foreign Affairs, R.O.C. (Taiwan). Failure to obtain the work permit and the Resident Visa after receiving acceptance into the program could result in disqualification.